Upon entering the gate, there will be two parking lots, make sure you remember where you park: P1 or P2, since these two parking lots are far from each other. 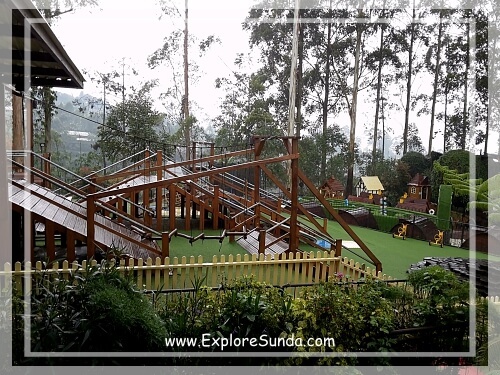 Similar to other parks in Lembang, we have to pay entrance fee to enter this park. Then, on the exit gate we can exchange 1 ticket for a bottle of mineral water, or 2 tickets for 1 plant. Once tickets are ready, we just need to wait for the shuttle to take us uphill to the center of activities. It is only a short ride though, less than 5 minutes. Then, we will arrive at the main building where the restaurant and a food court resides. This foodcourt and souvenir shop called Pasar Khatulistiwa is the center hub for all of the activities here. 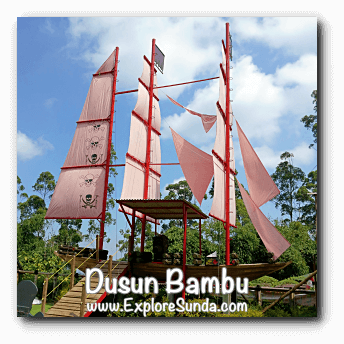 Since Dusun Bambu is a huge place, the activities are divided into several places: Taman Arimbi, Kampung Ulin, Tegal Pangulinan, Rabbit Labyrinth, Rabbit Wonderland, Creativity Ship, and Bamboo Playground. 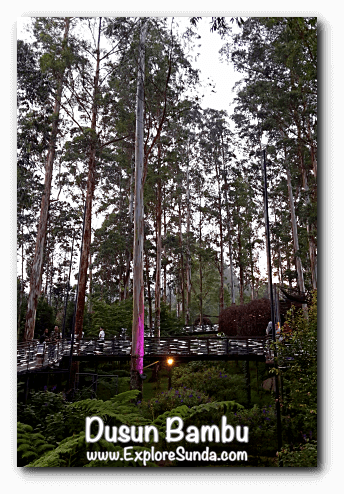 This garden is usually what we see first when we arrive. Plenty of colorful flowers decorate it. People love to stroll as well as taking pictures here. 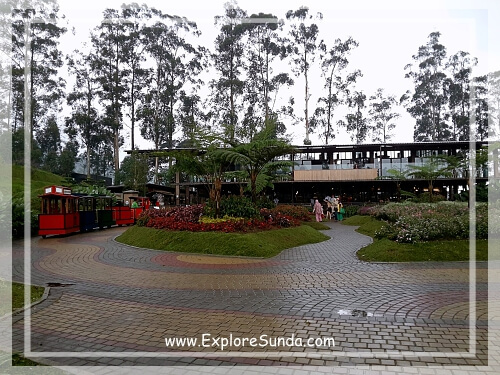 Since it is located close to Pasar Khatulistiwa (the food court), we can just relax and dine in the food court with a beautiful scenery of the flower garden. This playground is located on one side of the food court, so parents can easily watch over their children. Parents are also allowed to accompany their children, especially the young ones. 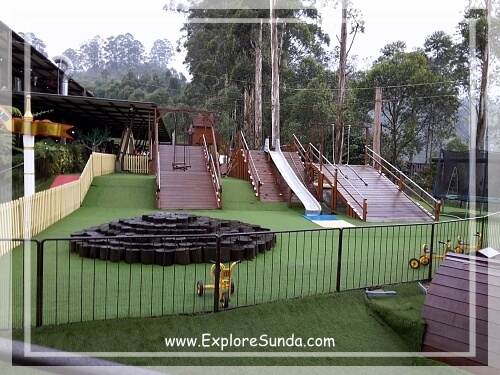 Children can run around, climb, slide, walk on the bridge, and crawl in the tunnel. 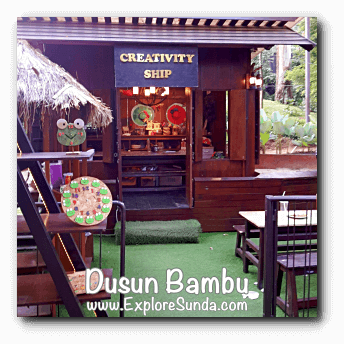 It is a small workshop located near the entrance of the Bamboo Playground. The materials required is already prepared by the staff and she also will guide the children how to create the chosen crafts. For example, making slime. 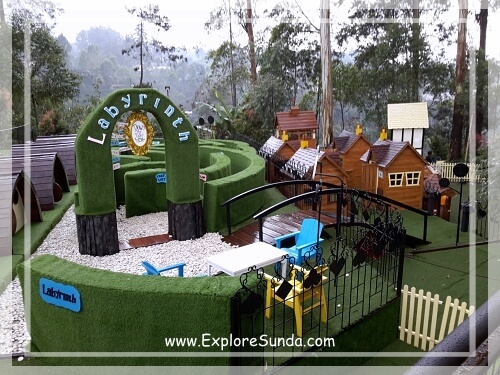 It seems feeding rabbits is a must in any park in Lembang. 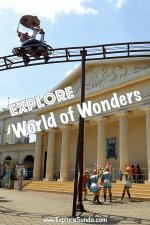 There are two places to do that here, at Rabbit Labyrinth and Rabbit Wonderland. The difference is only on the settings. 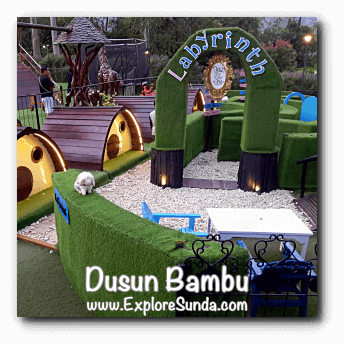 The labyrinth is approximately one meter tall, and the rabbits can run on top of it. We also can feed them and take pictures up there. 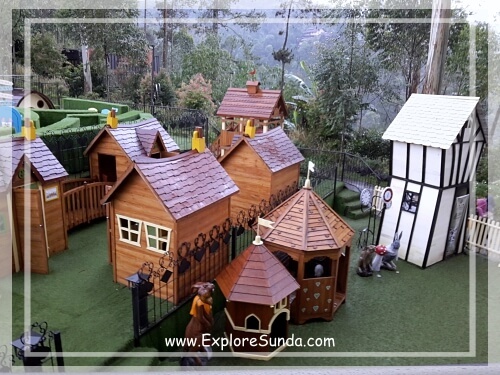 Rabbit Wonderland is next to the labyrinth where the setting capture the scenes of Alice in Wonderland with its cute little homes. 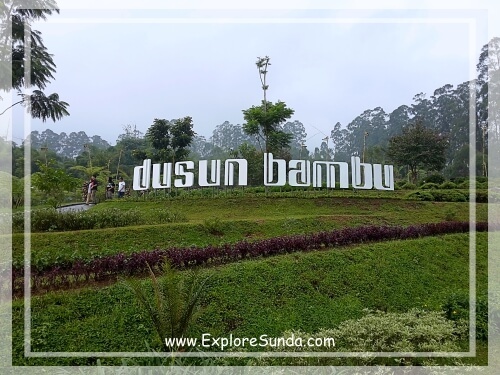 Dusun Bambu claims they have hundreds of rabbit, so we don't have to worry the rabbits are too full to eat :) They also have various types of rabbits, you can choose your favorite! 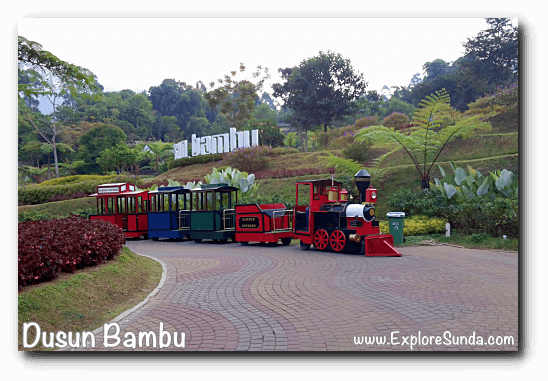 These places is located next to the Bamboo Playground. Alternatively, we also can feed animals in Kampung Ulin. 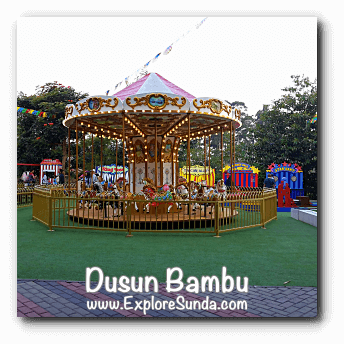 A bit farther from the garden we will reach Tegal Pangulinan, which is a Sundanese phrase for playground ;-) This is a newer playground than the Bamboo Playground. Its set up looks like a fair with a carousel, trampoline, and several booths of games, such as throwing darts, ball, rings, etc. and the winner will receive a prize. 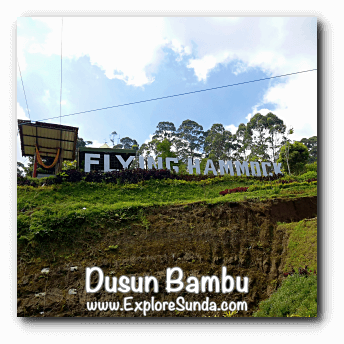 Walking further up the hill, we will reach Kampung Ulin (kampung means village, ulin means play). There are many booths on each side of the road, each offers different type of playing. 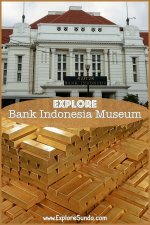 For example, we can paint a shirt, learn how to create batik, do pottery or paint it. 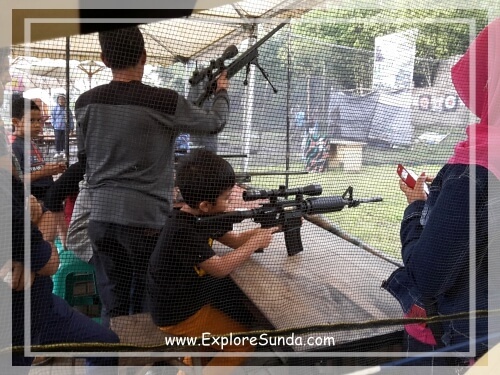 Not only making crafts, they also offers some games, such as shooting balls from a pirate ship to hit some targets, paint balls, and shooting ranges for archery and rifle (not the real ones). If you like animals, perhaps you want to try petting the snake, feeding rabbits and their friends, riding a horse or relaxing in the fish spa. They even have a cart riding drawn by a horse. Unfortunately, the cart is made of iron, it is too heavy for a single horse, so whenever they go uphill, the staff in the rear must help pushing the cart. 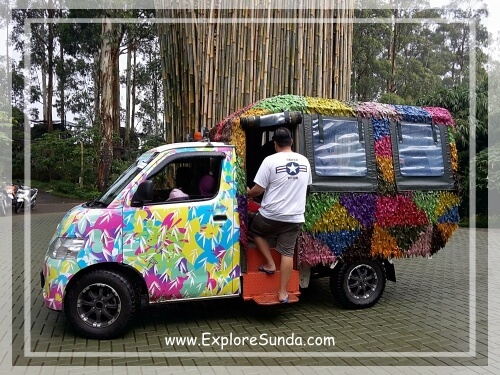 Since Dusun Bambu covers a lot of land, cycling a bike sometimes is preferable than walking. The good news is there are some bicycles for rent here. 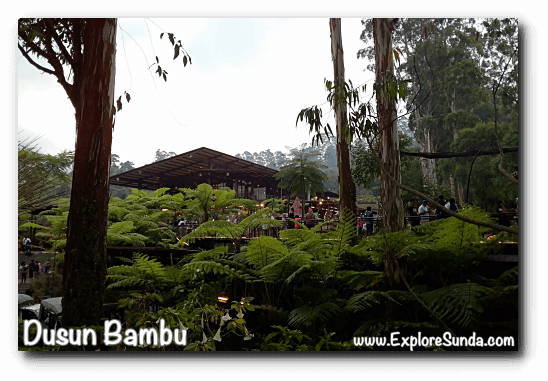 Each activity in Dusun Bambu requires separate ticket. The ticket price for each activity varies between Rp. 25,000 and Rp. 75,000 and there is not any one day ticket that covers them all. 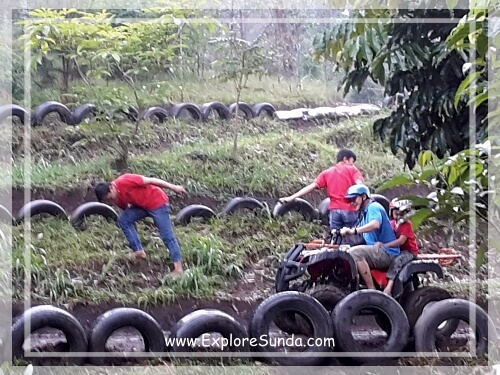 The good news is that we can choose whichever activities suitable for our family, but the bad news is by the end of the day we might be very surprised when we sum up our total spending! 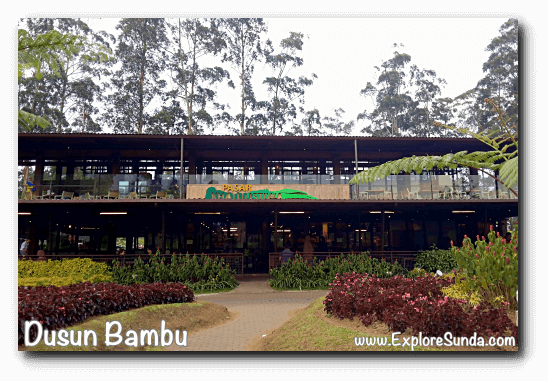 Pasar Khatulistiwa is the foodcourt in the heart of Dusun Bambu. Many types of food are sold here, most of them are local, such as soto, ox-tail soup, and rice set with fried chicken. There are a lot of side dishes too. For example, sausages and french fries, grilled corn, cotton candy, ice cream, and traditional cakes. It is a restaurant with view of mount Burangrang. 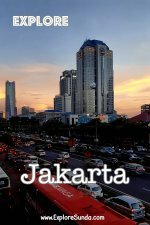 Its location is near Pasar Khatulistiwa, but it is much less crowded. 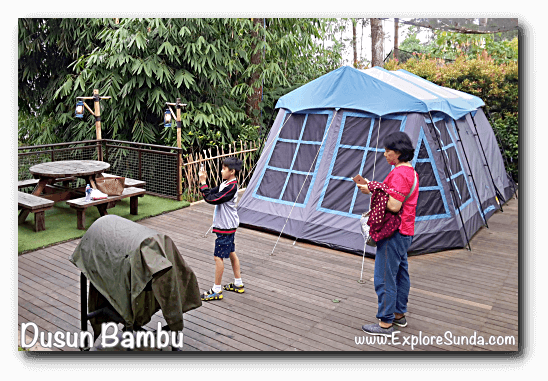 Saung is a Sundanese word for a hut, where usually farmers take a lunch break in the middle of their paddy field. 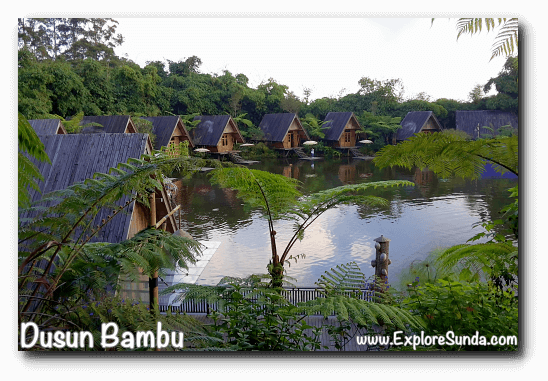 Having that thought in mind, Saung Purbasari is a series of huts circling a pond. There won't be any dining sets in these huts, because we will eat on the floor. It is called lesehan. 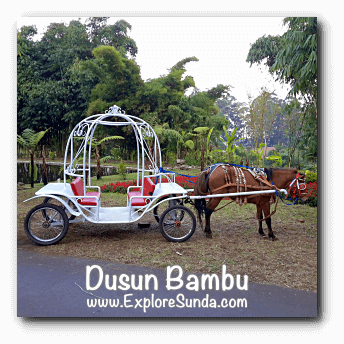 It is more private than other restaurants in Dusun Bambu, because each saung will only be occupied by one group of guests. Last but the most unusual one is Lutung Kasarung. 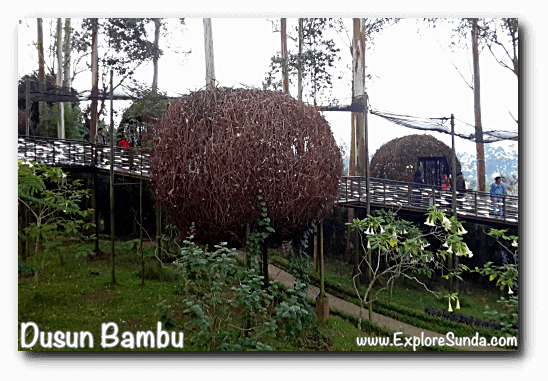 Named after the legendary Sundanese folk lore, it looks like several bird nests connected with wooden bridges between tall trees. Each 'bird nest' is actually a dining room complete with its dining sets. You can dine-in here, you even can just rent the room only without ordering any food. 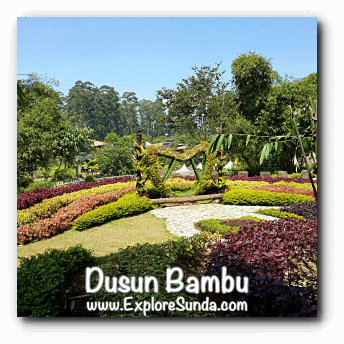 The address of Dusun Bambu is jalan Kolonel Masturi km. 11, Cisarua, a village between Lembang, Bandung, and Cimahi. Hence, you can drive from either of Bandung (access from jalan Setiabudhi across the Ledeng bus station), Lembang through Cihideung village to Cisarua, or Cimahi (jalan Kolonel Masturi is near the town square, once you turn into this road, you only need to drive straight). The GPS Coordinate are 6°47'20.0"S 107°34'51.6"E.
The location is quite close to Cisarua bus station, if you want to take a public transportation.